Whether it’s your wedding, birthday, anniversary, or graduation, you can commemorate the special occasion in a meaningful and impactful way - by helping animals in need! 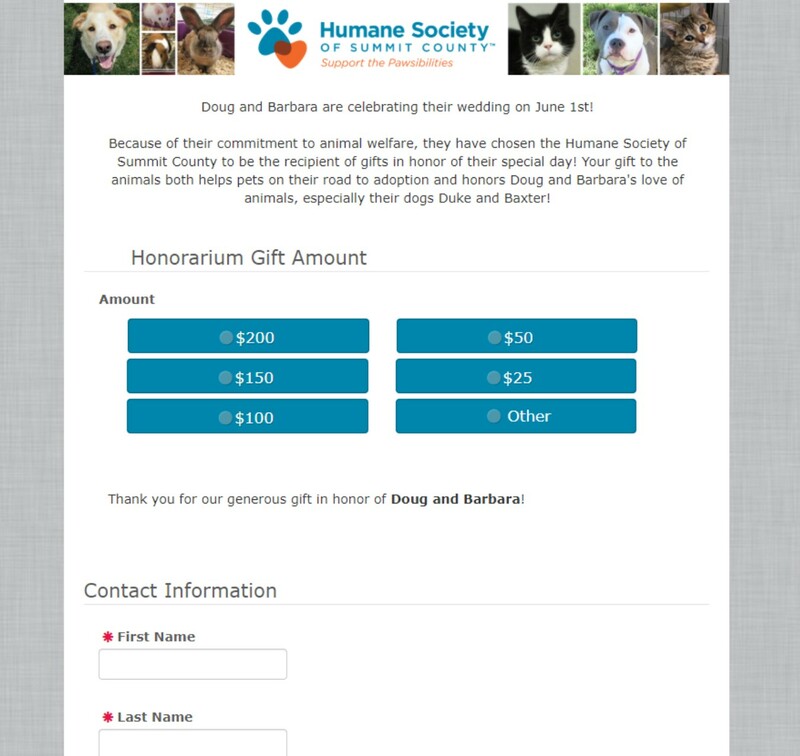 As a charitable alternative or addition to your gift registry, we will help you create a custom web page to request donations from family and friends in honor and celebration of your special day! Blue, a Great Dane/Pit Bull Terrier mix awaiting adoption at the Humane Society of Summit County, and longtime shelter volunteer Ted Moore are teaming up to make a big change for their health and help other pets awaiting adoption along the way. Follow their journey to wellness through exercise, eating better, and other lifestyle changes through Ted's monthly blog. November is Veteran Adoption Month! This extra-special promotion will help to connect homeless animals with United States Armed Forces veterans and active military in need of companionship. The emotional support of companion animals has been clinically shown to have significant psychological, physiological, and social benefits for adopters, improving overall well-being. For more information about our adoption process, adoption hours, and most of our adoptable pets, click the button below! Help rescue animals through Acme Community Cash Back! Save your receipts! From August 9th through December 29th, 2018 Acme Fresh Market is holding its Community Cash Back promotion. When you shop at Acme and submit your receipts to HSSC, we earn 5% cash back on certain products which helps to support our animals here at the shelter. In 2017, we raised over $2,000 from generous supporters just from saving and submitting receipts. 2. Community Cash Back earnings are listed at the bottom of your receipt. Celebrating 50 Years of Animal Rescue! Foster families and supplies needed! Help us save lives! Each year, we rescue and care for over 800 kittens, many of whom require specialized care with a foster family before they are ready for adoption. You can help! Support our efforts by becoming a foster family! Learn more about our foster program by attending one of our upcoming Feline Foster Orientations! This free, no obligation session is open to the public and will introduce you to the "Ins and Outs" of fostering through HSSC!